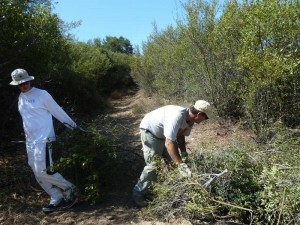 On Saturday morning, September 15, fifteen volunteers from the Santa Monica Mountains Trails Council trail crew, Calabasas Day Hikers Meetup group and CORBA gathered in the parking area at the bottom of the Mesa Peak Motorway singletrack, a segment of the Backbone Trail in Malibu Creek State Park. We had learned the evening before that possibly hundreds of road cyclists and onlookers would be gathering at the corner of Piuma and Malibu Canyon Roads for the annual LaGrange Piuma Hill Climb. This was less than 1/4 mile away, and we could envision all the parking being taken up by this group, but as it turned out, there was just enough parking for the trailwork volunteers. Looking at the huge rut and planning how to fix it. Our job for the day was to fix an extremely serious rut near the trailhead, clean out existing drainages and install new ones to prevent further water damage and rutting, and cut back several years of overgrowing brush. The challenge of the work would be compounded by temperatures expect to reach just over 100 degrees. Fortunately 90% of the work was in the shade. Also, CORBA provided lots of water for those who ran short, and two of us had mist bottles to spray down coworkers from time to time. The Trails Council crew did most of the the treadwork, filling in the huge rut much more quickly than I had expected, then going on to clean out old or build new drainages. These drainages are critical to preserving the trail by shunting the water off the side, so it doesn’t run down the middle of the trail and cause further errosion and huge ruts. 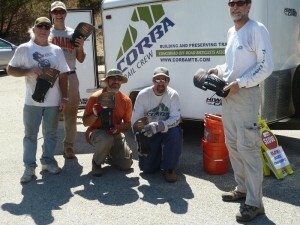 Meanwhile, the CORBA and Calabasas Day Hiker volunteers mostly grabbed loppers and saws and went to work on the overgrowth. The brush to be removed had previously been marked with bright orange surveyor’s tape. After cutting down the brush, the tape was removed and pocketed, then the clippings were tossed over the edge, hidden from view of the trail as much as possible. 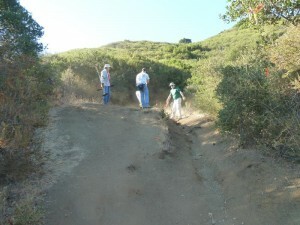 We took off the orange plastic tape because it would become trash on the hillsides as the clippings slowly decomposed. We finished up the workday about an hour earlier than planned because of the temperature. Besides, we had already accomplished almost everything that could be done. A word of warning: The trail is fairly smooth where we filled in the huge rut, but it is very loose due to the dry conditions. Be careful when riding through this section! The loose dirt extends down at least a foot, and is up to two feet deep where this rut was filled in. 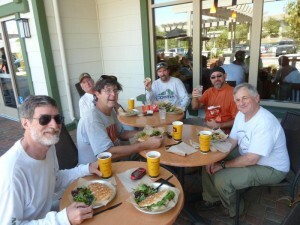 View all the photos in our trailwork photo gallery! 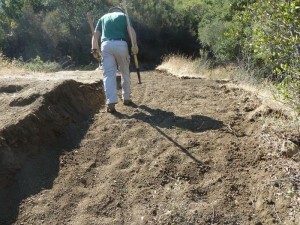 This entry was posted on Monday, September 17th, 2012 at 7:23 pm and is filed under Santa Monica Mountains, Trail Building and Restoration, Trail Crew, Trail Hazards. You can follow any responses to this entry through the RSS 2.0 feed. You can leave a response, or trackback from your own site.